I recently read a satirical article from The Onion about how a vacation for a mom is really just the same old chores in a new locale. 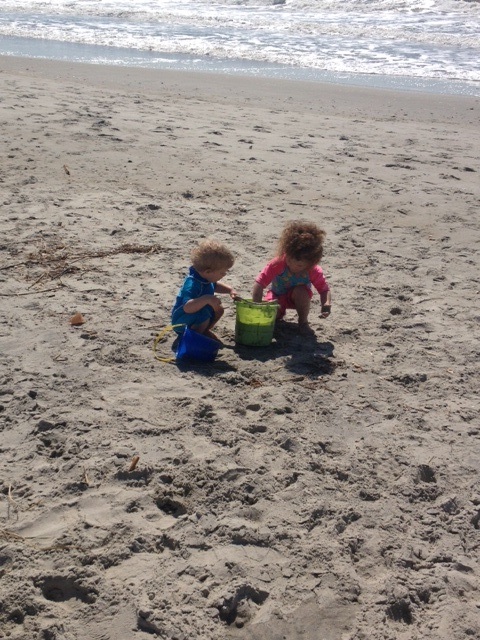 I have also heard many moms say “it is not a vacation, it is just a trip.” Though I agree with some of these observations, last week I was pleasantly surprised by the benefits of a beach vacation/trip that are often overlooked. There was a definitely a time when my trip to the beach entailed multiple books, the latest celebrity gossip magazine, and not a care in the world. With children, as many of you know, that has all changed. However, I am not going to wax on about the tan, napping beach bum I once was. This year, I discovered something new. I noticed a few differences from our regular routine that I was particularly thankful for. We might be getting better at doing the beach. After a trip to the beach, hosing your children off outside is not only accepted, it is expected. An outdoor shower at our beach house was the only cleaning our kids got the entire time. There have been many times when I have looked at the kids after an afternoon in the backyard and wished I could avoid dragging their little dirty selves inside. You know, I wanted to “hose them off in the yard.” But here, in Columbia, outdoor showers are rare and hosing them off seems a little pet- like (and may be against a city ordinance for all I know.) At the beach, there may be sand, sunscreen and saltwater, but there is also outdoor showers. Suds up in the great outdoors and track nothing in for mom to clean up later. Beach play often equals very heavy sleeping. (Steady-breathing, possible-slobber kind of sleep.) We didn’t have a strict schedule at the beach, but when it was time to sleep it was some serious REM. Those little legs had carried the kids back and forth to the ocean to the sand castle back to the ocean again all day long. My husband said he thought our three-year-old walked miles on the same stretch of sand back and forth, but at the end of the day, her tired and clean (from the outdoor shower) self SLEPT. So, I may not be the tan, well read or well rested beach girl I once was. Kids or not, my beach days were changing. I have become more worried about sunscreen than tan lines. I worry more about what imperfections a bathing suit covers than the any assets it might have accentuated. But there are the things that I have and still embrace about being on the coast. On a beach trip, I still love salt air, no make-up, freckles popping up, and food tasting better than it does at home – whether it is a PBJ or fried shrimp. I maintain that the beach brings out the kid in most of us. I am happy to daydream and stare at the water, dig my feet in the sand, and even dig holes and build castles that I know will be washed away. With the discovery of these new beach perks and the constants of the beach I will ALWAYS enjoy, I think you will find me with my toes in the sand, watching kids play, and maybe even flipping through a gossip magazine before heading to the house to hose off and nap all together. This entry was posted in Family, Lara Winburn and tagged beach vacation, columbia sc, every woman blog, Family, Famously Hot, hospital blog, Lara Winburn, lexington medical center., Midlands, South Carolina Women by lexingtonmedicalcenter. Bookmark the permalink.